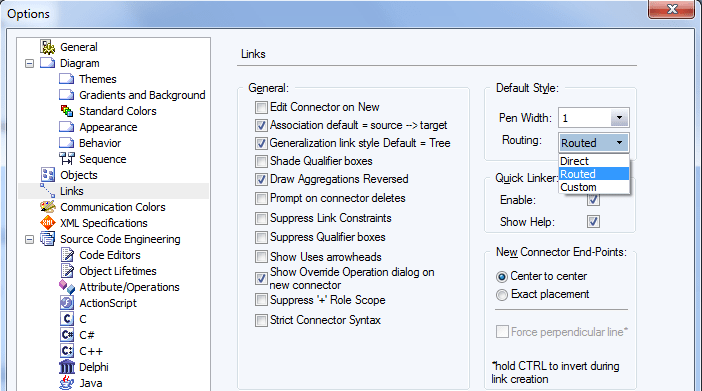 With this EA-Matic script you can configure your own default line-styles depending on the type of connector. 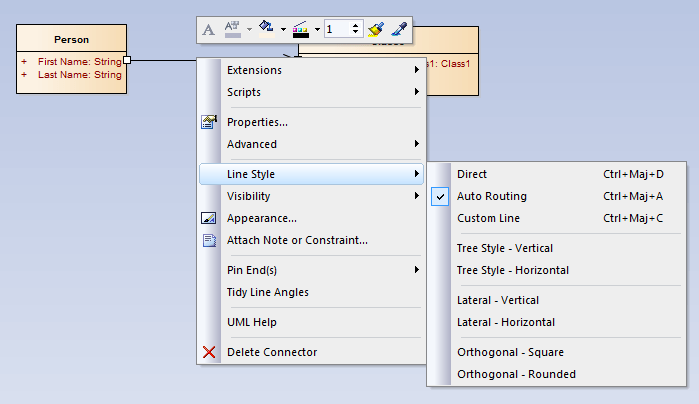 In Enterprise Architect you can choose from no less then 9 different line style for the connectors. Unfortunately you can only choose from the first three to be the default line style for new connectors. Additionally you can also specify the default for Generalization to be Tree Style. For me that is not enough. 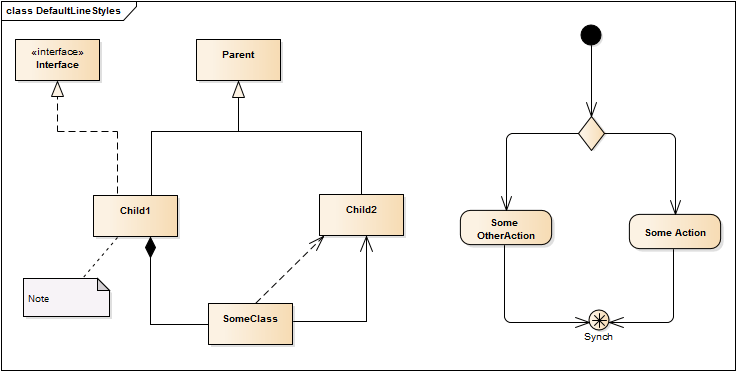 I have my own habits when making UML diagrams. For most connector types I use Orthogonal – Square, but not for dependencies, use case relations and note links. For those I like the Direct style. The last exception are the control flow, state flow and object flows, for which I use Orthogonal – Rounded. This EA-Matic script gives me the control I want. Not only does it set the default line style for new connectors, with the context menu I can reset all connectors on a diagram to my own default styles. menuDefaultLines = "&Set default linestyles"
This script uses 3 EA events. The first one is the EA_OnPostNewConnector which gets triggered by EA the moment you create a new connector. The next even we use is the EA_GetMenuItems so we can show a menu option in the context menu of a diagram. The last EA event is the EA_MenuClick, triggered when the user actually clicks on the menu item. And last but not least the method that will actually set the connector style. diagramLink.Style = diagramLink.Style & "TREE=" & tree & ";"
This entry was posted in EA-Matic and tagged add-in, EA-Matic, Enterprise Architect, Featured, line style, Sparx Systems, VBScript. Bookmark the permalink. I simply can’t understand why the choice of line styles is restricted in the Options panel, but I’d bet they simply forger to extend it when newer styles became available. Yes indeed. I’m sure they know about it, and plan to extend the choices in the future, but I guess these type of change request often have to make room for more urgent changes. Some help please. I’ve imported the script to EA. EA-Matic correctly shows the monitored events and lists the event handler routines. Yet, if I create a line, it will default to what is set in EA options, instead of being of that style set for that kind of element. (More precisely, I am trying to link an actor with a use case, using the script default lsDirectMode for use cases.. If this doesn’t work I’m happy to have a look at the script if you send it to me by email. Gonna send in an email, I’ve inserted a breakpoint at the beginning of a function, but that has not been triggered. Breakpoint won’t work when the script is executed by EA-Matic. I’l have a look as the script you’ve sent. I too am trying to recreate the above script. – You don’t have any previous versions of EA-Matic or EA Navigator still installed? It looks like it is using a part of the framework from an older version. That could happen if you still have an older version of EA-Matic or EA Navigator installed. Uninstalling all of my add-ins, and installed only the latest Bellekens EA Toolpack will probably sort this out. I think I have solved the problem – I had an old EA Navigator installed. Have uninstalled everything and reinstalled and now seems to be working. Just need to get the script working- Is the full script available anywhere rather than just the fragments? Or can you tell me where lsOrthogonalSquareTree etc are defined? Happy to see that you were able to resolve the issue. The variables like lsOrthogonalSquareTree are defined somewhere at the beginning of the script. Many thanks. And thanks for making EA-Matic avaialble. A fantastic utility. You’re welcome. I’m happy it’s being used. I am trying to set default line styles for the connectors using your EA-Matic script. I have downloaded the script and imported it into Enterprise architects from Project => Data Management => Import Reference Data. Now, how can i set the default line style to my diagram? How to proceed further? The EA-Matic script needs the EA-Matic add-in to be installed in order to function. Thanks for the quick replay. Now am able to set my default line style to all my connectors in my project. It really helped a lot geert. Thanks for your support. I have downloaded the EA-Matic script into EA from Project => DataManagement => Import Reference Data. But i didn’t get any menu item like “EA-Matic” in Extensions menu. I am trying to set default line sytle to OrthogonalSquare. How to proceed further? Any help would be much appreciated. Have you installed the add-in EA-Matic? Without the add-in the script will not work. Thanks for the quick replay. Now, i have installed EA-Matic add-in and am able to set my default line style. It really helped a lot geert. Thanks for your support. This is a super add-in to EA! How to include to EA-matic-script my own script with the common functions? and generates the error, that commonTest() couldn’t be found. Run “_autoUpdate / testCommonFunction” from the original EA works fine (with the uncommented “commonTest(“_”)” ). Make sure you include the string EA-Matic in all scripts that need to be used, so also the included scripts. Posting this to help those not so versed with EA-matic or how to load this script. 4. Double click the script and edit the top portion as wanted for your preferences. 5. Click save (YOU DO NOT NEED TO RUN). 6. Go to Extensions|EA-Matic|Settings. Make sure the three wanted functions are checked and click OK you should not have to change anything but doing this reloads EA-Matic and the script. If you make any more changes do this again. 7. You should be good to go to try out the connectors on your diagram.